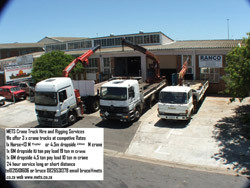 We offer the hire of our three CraneTrucks at competitive prices including the driver, rigger and slings. Our trucks can handle 6 and 12 tons respectively, and both have a 2.4m x 6.3m load space with a 6m container lock on the larger truck. Our large crane can handle 17 Ton/ Metre (8.5t@2m, 4.2t@4m etc) and the smaller one 6.5 Ton/ Metre. Our trucks are available 24/7 over both short and long distances.